2019 seems to have begun with a bang! We’ve caught glimpses of bikes being tested, patents being leaked and manufacturers branching out into different motorcycling genres. The week before was an exciting one, and this week doesn’t seem to disappoint either. If you’re a gearhead like us and curious to know what’s brewed in the two-wheeler industry in the past 6 days, have a look at what’ve listed down below. A couple of weeks ago, the mighty Busa was taken off the shelves from the European markets since it failed to comply with emission norms. 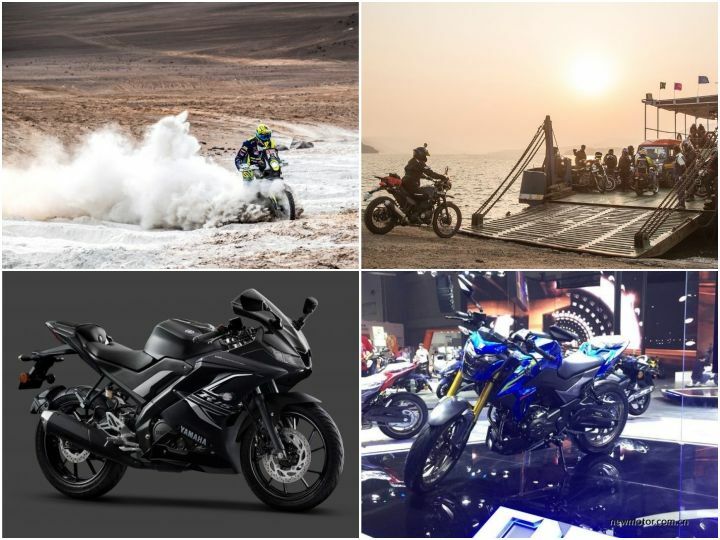 However, thanks to high demand in the American and Asian markets and relatively lenient emission norms, Suzuki decided to continue production of the bike until 2020. Post-2020, the Japanese manufacturer plans on unveiling a brand new Busa, well, at least that’s what the recently filed patent suggests. From the looks of it, the next-gen Busa will feature an updated Euro-V-compliant engine that’s reportedly more powerful than the current iteration, a new chassis and a new swingarm. Unfortunately, the design of the bike is still wrapped in clouds. For more details, click here. With the government safety norms coming into effect soon, most manufacturers are hustling to equip their bikes with ABS. Take Royal Enfield for instance: almost its entire lineup now gets either single-channel or dual-channel ABS. And Yamaha isn’t one to shy away from a challenge. Reports suggest that the bikemaker plans on arming its bikes above 125cc with ABS starting February. That said, Yamaha very sneakily launched its track-focused R15 V3.0 with the safety net of dual-channel ABS before the anticipated date. Moreover, to spice things up for 2019, the company also threw in a new paint scheme. Head here for the complete story. The Pulsar 220F finally gets a single-channel ABS unit! And it’s about time. The iconic bike was just recently updated with new graphics and a belly pan for 2019, which also saw a slight bump in price. And now, with the inclusion of ABS the price has been revised once again. For more information on the bike and the price hike, head here. According to our sources, the much-awaited quarter-litre from Suzuki is expected to be launched by mid-2019. The new Suzuki 250cc motorcycle is likely to be priced around the Rs 1.3 lakh to Rs 1.5 lakh and it’s positioned to eat into the Yamaha FZ25’s market, which, until now, enjoyed the space for itself. Here’s what we can expect from the Gixxer 250. The Indian two-wheeler manufacturers, Sherco TVS and Hero MotoSports, have been preparing for the past year to compete in the toughest rally in the world, Dakar 2019. And, their efforts seem to be paying off, as, right from the beginning of stage one the two bikemakers have been giving their competitors a run for their money. If you’re curious to know where the Indian contingent stands in Dakar 2019, click on the following links. The annual RE Coastal Ride is all set to be flagged off from Mumbai on January 26 and end in Kanyakumari on February 7. The ride which spans across 12 days will traverse through the Western Coast and covers states like Maharashtra, Goa, Karnataka, Kerala and Tamil Nadu. We’ve listed down the complete itinerary for the ride along with the cost and exclusions. Head here for more information.